"Sampath Speaking" - the thoughts of an Insurer from Thiruvallikkeni: Samburu lion killer is killed by pack of hyenas ! Hunting animals is a sports – a colonial vestige - killing animals and displaying them as trophies – was a pastime of British – and this practice perhaps existed even before ….. miles away in Maasai Mara, the Maasai people have traditionally viewed the killing of lions as a rite of passage. Group hunting, known in Maasai as olamayio, gives the lion population a chance to grow. Maasai customary laws prohibit killing a sick or infirm lion. The killing of lionesses is also prohibited unless provoked. Is there really any valour in killing a lion with many modern gadgets ? ~ and what is accomplished by such killing ?? 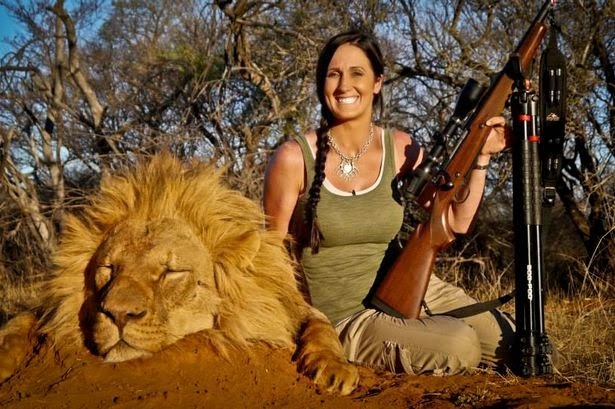 About an year ago, Melissa Bachman, the American big game hunter and TV presenter sparked international outrage by posing with a lion she shot in South Africa. It all began with a posting on Bachman's Facebook and Twitter pages – the photo stating "An incredible day hunting in South Africa! Stalked inside 60 yards on this beautiful male lion... what a hunt!". Bachman is the host of a US TV show called Winchester Deadly Passion. The title is a reference to the famous brand of rifle -her hunting act was condemned by animal rights activists. She had to shut down her Twitter account in a bid to escape public censure. More than 250,000 people signed an online petition calling for her to be banned from South Africa. Hyenas are fierce hunters, hunting in packs; they catch prey with their teeth rather than claws. Although long reputed to be cowardly scavengers, hyenas, especially spotted hyenas, kill as much as 95% of the food they eat, and have been known to drive off leopards or lionesses from their kills. Hyenas are primarily nocturnal animals, but may venture from their lairs in the early-morning hours. While hyenas are known as scavengers, they also possess great intelligence and skill on the hunt. Hyenas live in social groups — a clan can have as many as 50 members, headed by a female. As with elephants, this alpha female is known as the matriarch. Spotted hyenas are often called “laughing hyenas” because their giggle vocalization sounds very much like hysterical human laughter. The giggle is a loud, high-pitched rapid series of staccato “hee-hee-hee” sounds. Samburu County is a county in Kenya, covering an area of 21,000 km² (8,000 mi²) in northern Kenya. It includes the Samburu National Reserve and Buffalo Springs National Reserve, and Loroki Forest. The Samburu are a Nilotic people of north-central Kenya that are related to but distinct from the Maasai. The Samburu are semi-nomadic pastoralists who herd mainly cattle but also keep sheep, goats and camels ~ and here is an interesting news reported in BBC. Killing a lion is a rite of passage for young Samburu males….. but a Kenyan herdsman who fought off and killed a lion, has died after being attacked by a pack of hyenas. BBC reports that Moses Lekalau, 35, was walking home in the Maralal safari area north-east of Nairobi when the lion leapt out at him. He fought the lion for half an hour; speared and bludgeoned it to death; exhausted by his struggle, he lacked the strength to fight off a subsequent attack by hyenas. Though he was eventually rescued by a passing motorist who drove him to hospital and . He was airlifted to Nairobi for surgery but died of blood loss. As a Samburu, he came from a community where it is traditional for boys to kill a lion as a rite of passage on entering manhood. He spent seven hours in the operating theatre where doctors treating his extensive injuries were at first hopeful he would survive, but he had lost too much blood. National parks in Kenya are not fenced off and the wildlife roam freely so animal attacks are quite common in rural areas. We generally think that Zoological parks are good for animals…. Sometime back a Danish zoo made international headlines for killing a healthy giraffe and month later it killed four lions to make way for a new male. Two of those were young lions that were not old enough to survive by themselves and would have been killed by the new male lion if it had the chance, a spokesperson was quoted as saying. The other two were the youngsters' parents, described by the Copenhagen Zoo as a "very old" breeding pair. The zoo had to put down the old lions and their young offspring "because of the natural structure and behavior" of the lion pride, the Copenhagen Zoo said in a prepared statement.